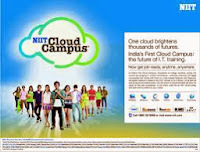 Cloud Campus in NIIT - Scholarship Options - Start Career in Infosys, TCS, Wipro, IBM etc. NIIT Post Graduate Programme in I.T. (PGPIT) is the quickest way from college to a career Information Technologies. The uniqueness of the PGPIT also lies in its Project Training which is 6 months internship that gives students the opportunity to work at leading IT organizations. Get an option to start your career in leading organizations like Infosys, TCS, Wipro, IBM etc. 1. Use the below link which opens in a new window. 3. Respond to the email or feedback you receive in your inbox.